The SCX-4200 digital productivity centre is perfect for home-use, home office or back to school. True 3 in 1 multifunction capability at laser printing costs significantly less than inkjet. The SAMSUNG SCX-4200 is the world's smallest multi-functional printer. Save space but don't compromise on speed with the SCX-4200. If your desk space is cramped or want to more workspace, you'll be tempted to take it with you. At approximately 16x14x9 inches (409 x 362 x 232mm), just slide it beside your laptop or monitor. Everyone could use a bit more space in their work environment, and the SCX-4200 gives you room to breathe and more. At 9.3kg, it's light, too. The printer is so compact, perfect for work-from-home jobs, students, freelancers, and personal businesses, this machine suits your everyday needs. The SCX-4200 is not just small, swift and super-powered, it's also easy to use. With its illuminated control panel, all the machine's functions are accessible at the touch of a button. Its high-speed scanning and making your copying jobs quick and painless, saves paper cartridge and toner changes, ID copying, efficient OCR function. This digital all-in-one scans colour documents at enhanced high quality resolution (4800 x 4800dpi), Superior colour-matching ability and strong grayscale produces copies with all the little details intact. You won't be disappointed with its high-powered scanning performance where, above all, the small things matter. Only SAMSUNG printers offer a special ID card copy function. Copy both sides of your ID card or other small documents on a single page with this unique and useful feature. Saves time, hassle and paper. The Advanced OCR (Optical Character Recognition) function scans your documents and converts them into editable rich text format. No need to retype, just save as electronic files for future reference. Other features of the SCX-4200 include a USB 2.0 serial port and 75sec. for scan speed, 11sec. FPOT (First Page Out Time). The SCX-4200 saves valuable time with its high-speed performance. At 18ppm, this printer works as fast as higher-priced models for the same rapid output for both digital copying and laser printing. With a resolution of 600x600dpi, copies are clear and distinct, just like the original. Change the original too, with a zoom rate of 50-200% for digital copies. 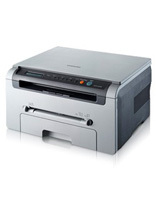 If you demand top speed and high quality printouts, the SCX-4200 delivers. The SCX-4200 comes equipped with OCR (Optical Character Recognition) software that eliminates the typing. Just scan a text document and OCR transforms the words into editable rich text. Now you can spend your time editing the document instead of typing!